So being a foreclosure every was just kina gross, shower was no exception, it had a plastic pan and cheap white tile on the shower walls and floor. 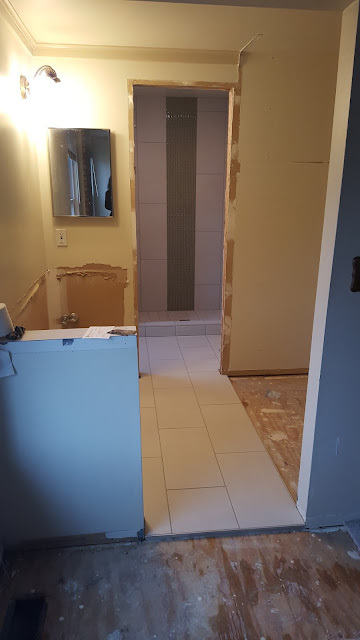 I ended up having the whole bathroom demoed by the tile guys, and I think it was something that was worth it! 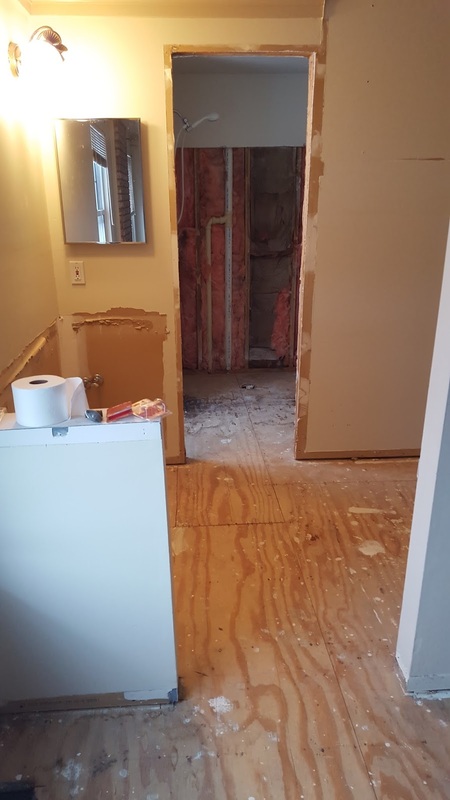 So when I started, there was a door to the shower/toilet room, and the vanity was open to the bedroom and closet with carpet. 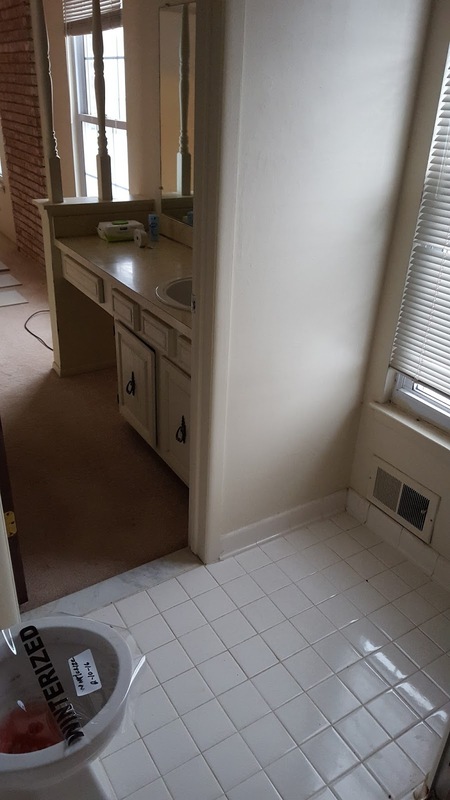 Again - carpet in bathroom? Why? 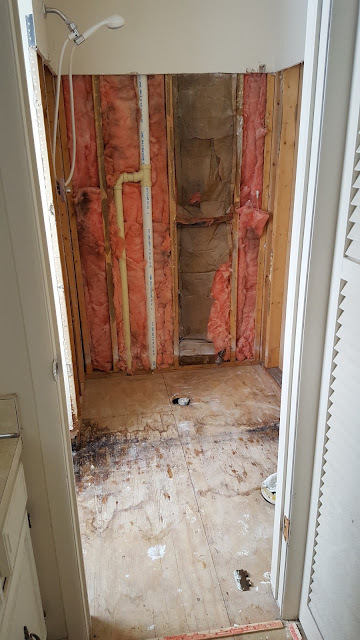 Professional gut job, I ended up using two of the Baster dumpster bags from Home Depot. 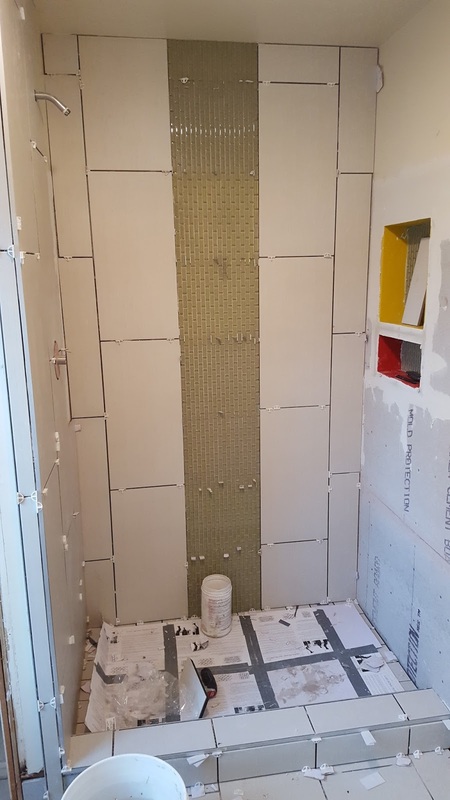 They worked really well, and held quite a lot. My only complaint was that there was like maybe a $20.00 savings to pick up two at the same time from the same place. I would of though the discount would of been greater. 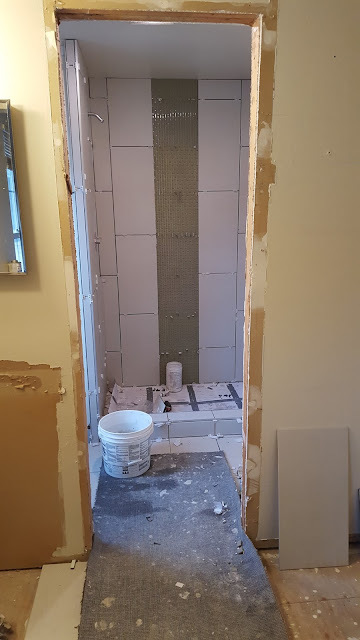 At this time I decide to remove the door going into the shower area, and put a real door (well pocket door) into the bathroom. I used 24 x 12 tiles from Home Depot on the floors (of all 3 bathrooms) and the shower walls. They had a linen pattern but I like that they were neutral and cheap, at less than $2.00 a square foot. I knew I wanted some type of an accent tile, but if you've ever shopped for accent tiles, or tile in general, its crazy expensive. I couldn't find anything I liked at Home Depot, and ended up at the Tile Shop. I got lucky and this Glass Brick was like 60% that week and I picked it up for about $8.00 a sheet. 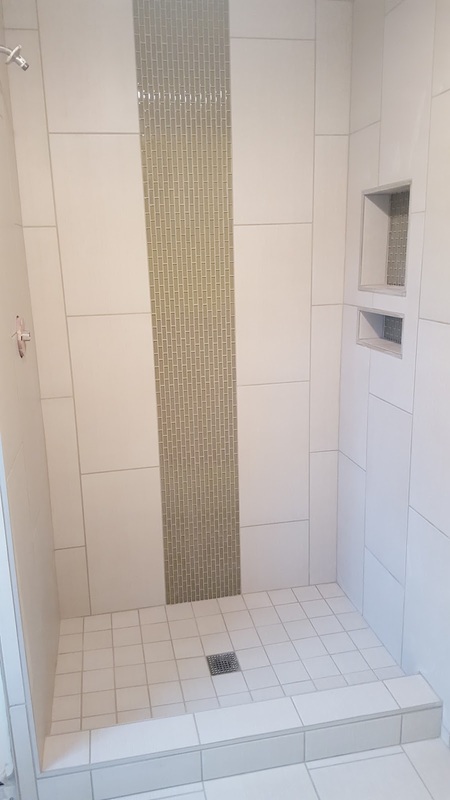 I had the time run to the ceiling in the shower, and the accent tile laid vertical for a waterfall look. They ended up using about 7 sheets so for less than $60.00 it added a lot of value. 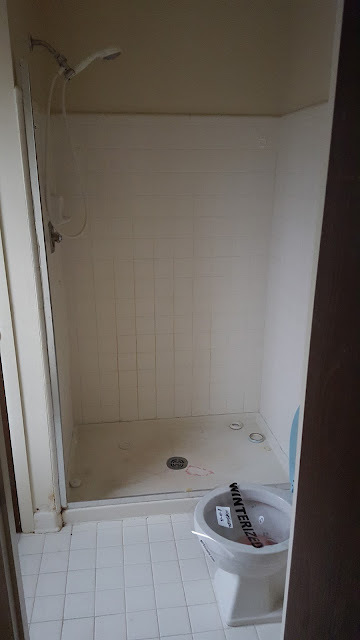 I also had two shower shelves built into the side, as I can not stand shampoo bottles on the floor or those hanging racks. 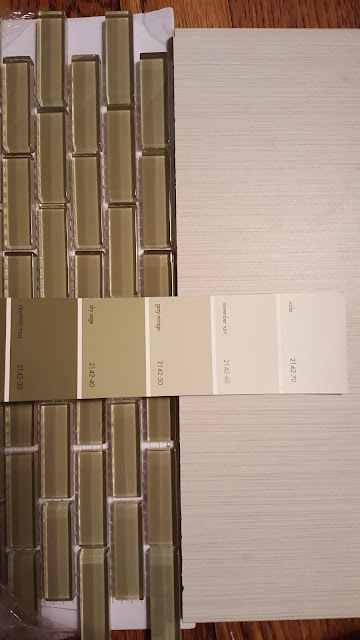 I went with a light grout called Alabaster, I believe it was the brand that was sold at Lowes. 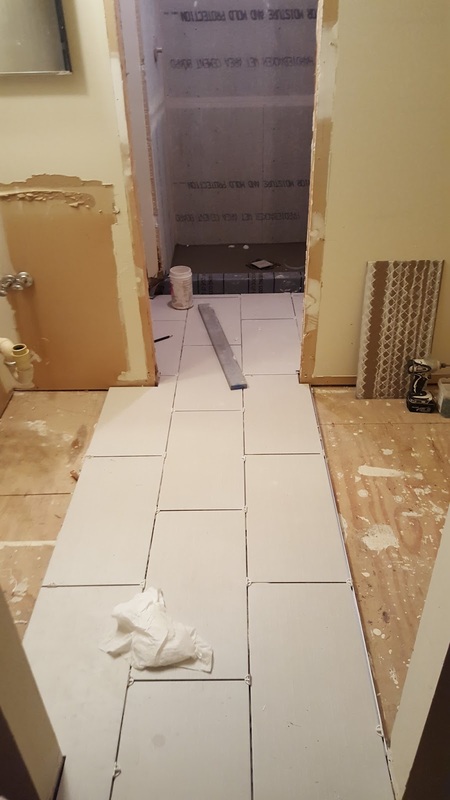 After the finished tile: I think this was the first project that was "done" but it was one of the only projects I had paid to have completed, so I always appreciated that I didn't have to lay tile.